Tastes and flavors dictate most of what we do. However, it is essential for us to listen to our guests in order to shape menus which will pique their interests as well as stimulate their minds and salivary glands. We are constanly cooking and adjusting combinations in order to be adaptable to most situations. (Every once in a while we are thrown for a loop and must admit defeat; a prospect I do not enjoy, which in turn drives us to continue cooking and exploring in order to avoid such instances.) Today we have assembled several dishes which are influenced by our current guests enjoyment of fish and lighter fare. When we first made the components for these dishes we did not know their application, rather it took several spins of the wheel to assemble and develop these dishes. I began the dissasembly of the pig. I set the hams aside to be whole roasted. The tenderloins are for me with breakfast. The loins will be marinated and gently cooked to maximize the sweet flavor of the meat. The trotters are brining and the head has been cleaned and reassembled for long cooking. The pig belly and shoulder have been sandwiched together to make a large plank with skin on both sides, doubling the crisp potential. 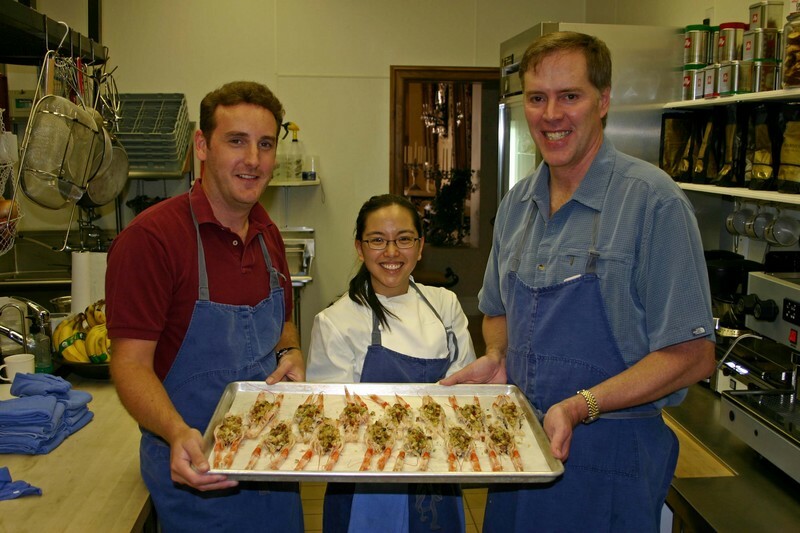 This is the Langoustine Menu created by our other cooking class. Thanks again to our guest chefs for their continued inspiration in the kitchen. Pork is the new black, actually dissecting and utilizing every porcine product from a herritage breed of pork is the new black. I have tried wearing black and it looks alright, though at the end of the day I still enjoy lime green and blaze orange. Enough fasion and into the food. We are a small place and a large pig can be overwhelming. Similarly, I enjoy working on a smaller rather than larger scale. So, we got in a small pig and are planning an array of dishes and preservative techniques in the coming days. I definately want re-look at slow cooked pork head as well as braised young pork belly. These preperations seem to make my mouth water and now that we are better able to control cooking temperatures and mediums a foray into the world of pork seems appropriate. I am lucky to have friends who read what we write. I am even luckier that they openly and candidly correct my mistakes. Recently I have gotten on a box about cooking potatoes with a method adopted by Heston Blumenthal of the Fat Duck. I have adopted the technique and consequently encouraged many to buy his book with the recipe as well as many other interesting facts, techniques and ideas. What I failed to mention and really absorb was Heston's inspiration was Jeffrey Steingarten the author of The Man Who Ate Everything. I was forced, and now gladly so, to revist this incredible compendium of culinary tales and research which divulges the basic essence of the mashed potato technique as well as presenting a source for the initial concept--the instant dried potato industry. Now, I am revisting Steingarten's work to see what other gems I mistook as coal. Think about this, I read the book cover to cover seven years ago. I did not pick up this technique. I have wasted a fair amount of time because I was unable to see into the details. Revist old favorites and ideas of yesterday with eyes and thoughts of today. You never know what you will find. This afternoon we had another one of our improvisational cooking classes. The great results come from the students not us. We simply introduce ingredients and pose questions, the answers become the class which in turn becomes a meal. By allowing the students to direct the class, we can act as guides along a trail while what we see and experience is based on what the students point out. I was most impressed with a simple dish which was formed by individual tastes, likes and dislikes; from an aversion to the insides of the langoustine heads to a fondness towards chorizo. 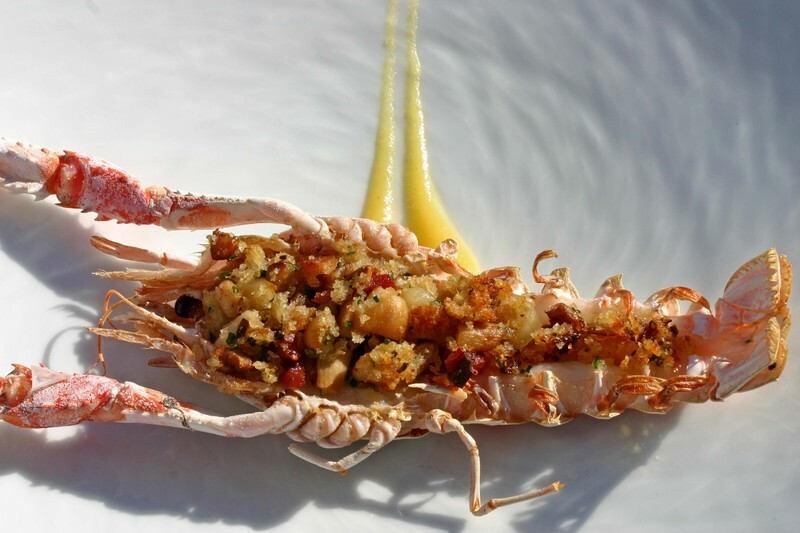 The dish is baked stuffed langoustines. 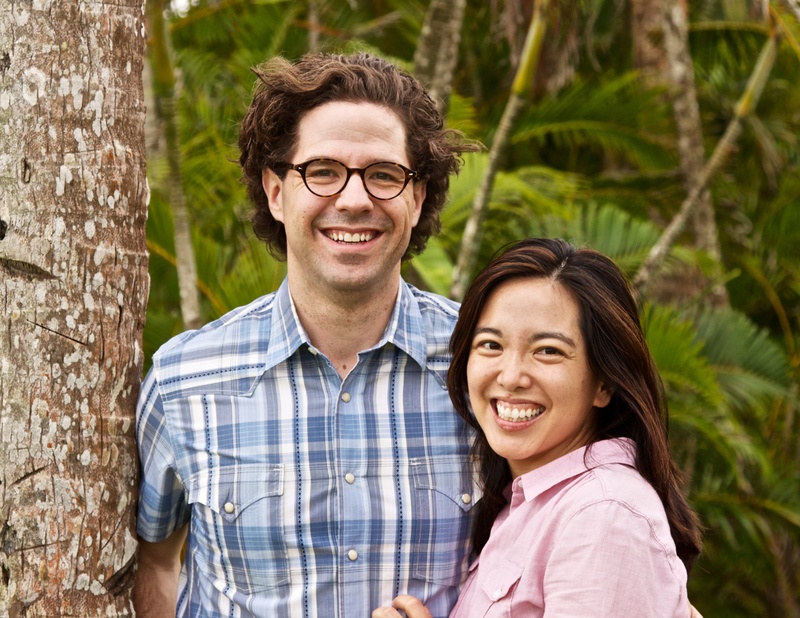 Here are the creators of the dish. I have been waiting for two important ingredients, wood and cashews. After I smoked peanuts, I opened my thoughts to what other nuts I could tamper with. I drifted to what I did not have, cashews. They arrived last week, but I was out of wood for my smoker. The wood arrived in four flavors: cherry, hickory, mesquite and apple. I opted for cherry wood and loaded the smoker with the nuts. The flavor is incredible, almost like chocolate. I took the nuts fresh from the smoker into the living room and began explaining with joy the process and how amazing smoked cashews are. After I calmed down, I thought about another great product which showed up today, fresh langoustines. With the taste of the smoked nuts in mind I assembled smoked cashew milk to be served with warmed langoustines, fresh chickpeas, grapes, nasturtium leaves and scallions. The dish came together, seeminly by a series of coincidences. Oh well, I am happy. As I mentioned previously, Heston Blumenthal has an incredible though time consuming method for making potato puree. Again I say buy his book for that and other recipes and discoveries. My newest adaptation of the recipe involves using the Thermomix to make the potatoes. It keeps everything in order and monitor temperature as well. Sure, some say why buy an expensive appliance and a book to make potatoes? My point is that these potatoes become simple and even more functional with a Thermomix. If you have one, make these potatoes. If you do not, buy the book first and use the potatoes as an excuse to buy the Thermomix. “This box really stinks!” These are not the words I want to hear out of the mouth of my favorite FEDEX delivery person on a Friday afternoon. Here in Pagosa we don’t get deliveries on Saturday so if something isn’t right on Friday this creates a bit of a problem for us. I was sort of tired, about to grab a break before four new rooms check in and it had already been a challenging sort of day. The box in question was extremely large, shiny silver one with Honolulu Seafood printed across the side. Yes, I know it’s eat local month out there in the blogosphere and there are those who are probably saying it serves me right for importing, but local products are somewhat limited here. Anyway, I knew the box was full of langoustines so as she carted in two more large packages I carefully sliced open the fish box. The langoustines were beautiful, rosy and lively looking in neat rows. They were packed in layers of ice and ice packs in a Styrofoam lined box (apologies to the environmentalists but nothing else works quite as well for these purposes). The Styrofoam was fitted together but not sealed. As I frantically dug to the bottom of the box to locate the source of the smell, I discovered that there was a layer of Styrofoam peanuts, as a cosmic revenge, on the bottom of the box. All of the langoustines on the bottom were coated with them. Picking them out of each shell was not exactly an edifying pastime. When I reached the bottom I realized that the juices that had leaked from all of those pretty pink bodies had seeped through the box, cooking in the delivery trucks and creating the fragrant aroma of rotten fish. It was a false alarm and the FEDEX lady and I were both relieved. As she left I turned to the other two boxes, both on the large side. The bigger of the two was from the Chef’s Garden. It was about three feet long but would be relatively easy to unpack and check-in. Everything inside the box would be in smaller quantities. The other box contained a whole pig, a sixty-five pound pig. Did I mention that Alex had gone to the airport to pick up some of our arriving guests? I was on my own here. I suppose I could have found a housekeeper to help me but they were pretty busy at the moment and I knew I could handle it. I was so glad that there were no cameras around as I tried to heave this extremely slippery, extremely large (for me) pig out of its box. It was a bit of a dance for a while but I finally prevailed and got it laid out so that I could check its condition. It was another pretty specimen, pink and white (the vegetarians probably hate me today too), slightly bruised but not unduly so, fresh and almost smiling. We have big plans for this pig but you’ll find out about those later. Opening the last box was a pleasure. The intoxicating perfume of the French Loupes filled the air and the vegetables were mostly beautiful and easy to unpack. We got some fresh garbanzo beans which I've never tried before. They were a revelation, green and crunchy and still very chick pea like in flavor. Another new find was petite mixed okra, perfect for frying or sautéing whole and about the size of my pinky. Deliveries by mail are a bit of a crapshoot and it’s a nice day when they all work out. Usually we order a bit more than we need to compensate and usually that ends up being a good thing, today we’ll have to do a bit of preserving. This is never a bad thing, who knows what new twist we’ll come up with. Of course, I’ll probably smell like langoustines for days, but if I can’t live with that I’m definitely in the wrong business. Well, back to the kitchen I go. Some terrific spiny lobsters arrived at a door today. I have a fond memory of eating spiny lobsters on St. Croix years ago. The lobsters were simply grilled or baked with whiskey cream. I adored both renditions. The meat is sweet with a soft brininess, unlike the intense flavor of the sea presented in Maine lobsters. Today, I got to work with the spiny lobster. To be honest, I have always worked with Maine lobsters but never the spiny. Today I made sure to have my hands full of lobster and ideas. I broke down all but one of the lobsters; I may have to relive my childhood in presenting half a grilled and half a whiskey lobster to our guests, we shall see. The other lobsters were divided up and sealed in cryovac in various stages of preperation. 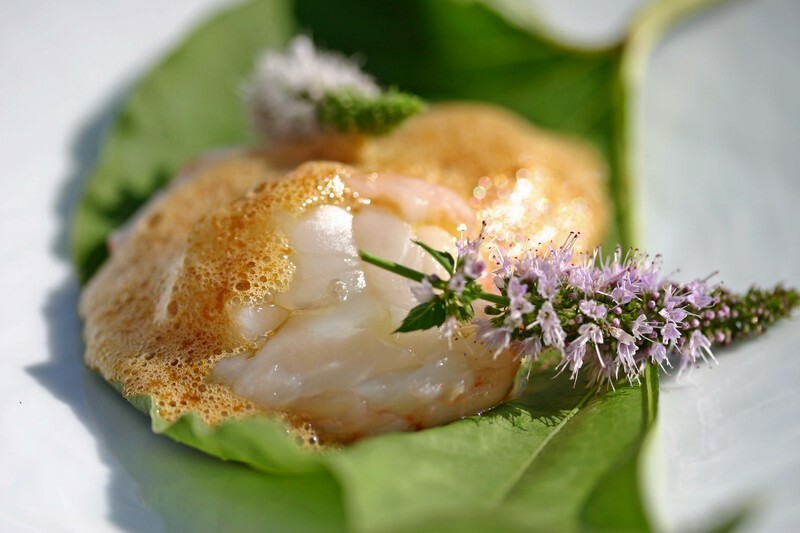 This evening we served gently cooked spiny lobster with passionfruit-soy, hoja santa leaves and mint blossoms. Tomorrow I will begin to further delve into the depths and promise of the spiny lobster. Beef, specifically. Let me start by saying that I personally am not a fan of Kobe style beef. I serve lots of it because other people love it, but I am a prime meat girl all the way. Kobe style meats are just too rich for my blood, which is not to say that prime meats are lean…they’re just more muscle than fat, with good marbling between the layers. I’d have to say that the opposite is true American Kobe meats, the good ones anyway. Some of them are actually more white than red. True to form, Alex loves Kobe meats. He loves the very richness and mouth-feel that makes me shudder. For the record, I’m not a fan of foie gras either and that’s one of his favorite foods. So, the perfect steak for me starts with dry aged prime meat. 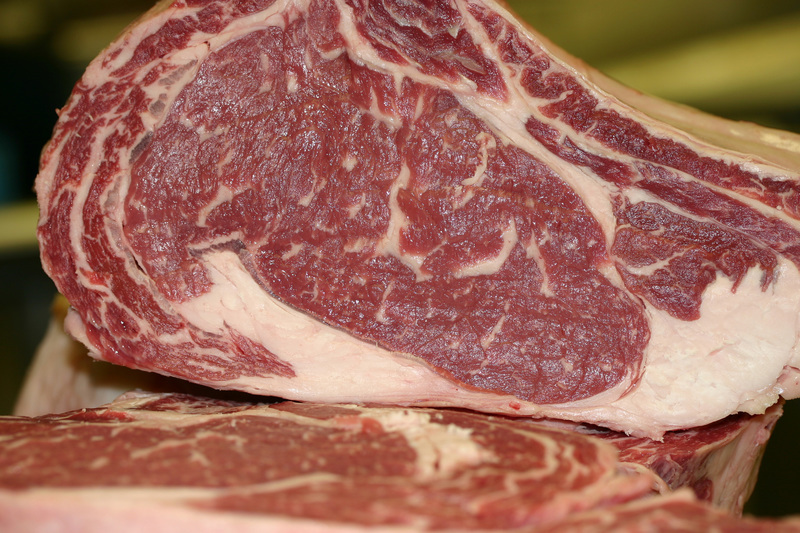 This is not an easy beginning as there are very few places that age meat properly. The waste is incredible and much patience is required. You will be rewarded by intensely flavored, rich, beefy steaks. There is nothing like a well aged prime steak but if your choices are more limited, a simple prime steak with little or no aging is nothing to sneeze at. Frankly, if I’m going to sit down and savor a juicy steak I’m willing to make an investment in the experience. I wouldn’t recommend prime meat for burgers, chili, stifado, skewers, or any other meal where the meat does not have the starring role. 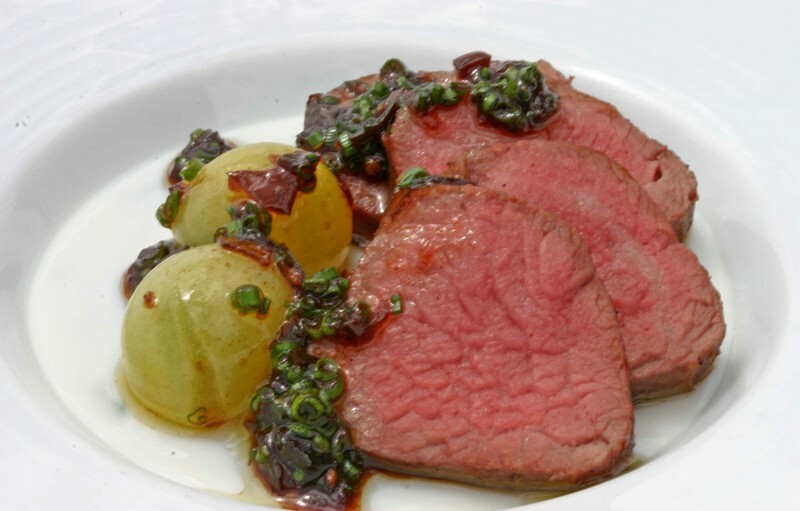 For those moments when all you really desire is a good steak, a rich red wine, perhaps a leaf of salad in a very mild dressing and some good bread, aged or youthful prime meat is the only option. The cut of meat may change, I most often reach for rib eye, followed by porterhouse, hangar steak, perhaps a sirloin, and on very rare occasions I feel the need for filet mignon. Skirt steak is my breakfast steak of choice with eggs but prime meat is not a necessity there. Once I have my steak it must be seasoned with sea salt several hours before I plan to eat it. This allows the salt to penetrate the fibers of the meat and travel to the center. During this process it will exude some excess water. This will help intensify the flavor of un-aged meat. Before cooking I pat the steak dry. If I’m at home an iron skillet will come into play. We generally cook 2-3 inch thick steaks, utilizing the leftovers the next day. Part of the soul of the steak dinner is its abundance, knowing there is more meat than you could ever possibly finish in one sitting. I put each skillet on a medium high flame with a light scattering of salt on its bottom. I heat it until it’s smoking hot and then gently lay the beef into the pan. I let it cook undisturbed until a thick crust forms on the bottom. Then I flip it over and continue to cook it until beads of juice appear on the surface. I remove the steak to a warm plate, top with butter and loosely cover with foil. While the meat is resting I deglaze the pan with chopped onions and whatever bottle is handy, leftover wine, tequila, dark rum, good beer, all will make a nice pan sauce with the caramelized onions. I pour the sauce over the steak, swirl the wine in the decanter, pull the warm bread from the oven and serve. In the restaurant we are little bit more refined. 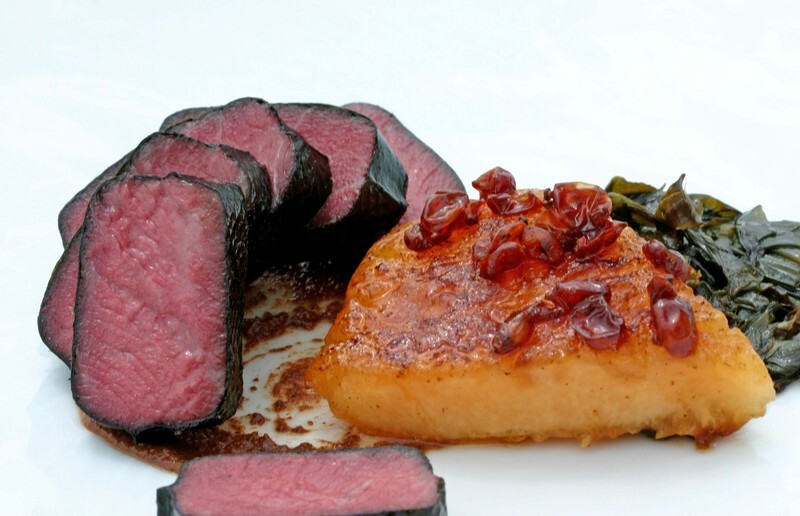 The beef is part of a composed dish, the starring element but not a solo performer. This week we are cooking beef in the immersion circulator for 25 minutes at 125 degrees for a steak that is about an inch and a half thick. Alex likes his meat rare, which is red and warm in the center. I prefer my steak medium rare, reddish in the center and hot in the middle. The reason I prefer medium rare to rare is the chew factor. Rare steaks tend to be too chewy for me. They’re like bubble gum, I could sit there and chew for days without being able to swallow. The slow cooking technique works for both of us. The meat retains its bright color and beefy flavor but the chew factor is completely eliminated. The meat is tender and toothsome, juicy and meaty. We’re very happy with the way the technique has worked out. We’ve cooked the steak straight, wrapped in nori and wrapped in Hoja Santa leaves. Each developed it’s own flavor profile, but the actual cook was very consistent. As most things in our kitchen tend to be, that slow-cooked beef is the best of both worlds. I seasoned the berries with salt and pepper and then wrapped them in the leaves. I proceeded to dry roast these fruit parcels to perfume and soften the stawberries and release the intense rootbeer aroma into the air. When the berries were warmed I opened the package and draped the hot Pierre Robert over them. I balanced the dish with mango-kosho (mango, yuzu-kosho, salt and lime juice) and our melon pepitas. The mango added a sweet and sour heat to the dish and the pepitas added texture and nuttiness. However, it was the perfume of the Hoja Santa leaf which stole the show, perfuming the room and tieing the dish together. I am constantly taking notes; these days on post it notes. These little yellow stickies are scattered over my bulletin board, desk, in my man-purse, on my nightstand, inside books I am reading and in the many places in between. Eventually, I take piles of these notes and input them into the computer in order to begin to organaize and develop ideas and inspirations. It is important to take these notes, for it allows my brain to empty for they are safely tucked away on paper or in a computer document. What is even better with writing down my thoughts is that I can always go back and examine my culinary approaches. Today I took a moment to look back at a more organized version of my note taking. What I find interesting is that while the flavor combinations still pique my interest and spark my thoughts, the process involved in executing these dishes has evolved and become more refined. The same list of dishes can take giant steps forward simply because of my own culinary development. I have reproduced the document without alteration such that I may share my inspirations from yesterday (five years ago) and see how they may be interpreted and executed today. Flavors are carried, formed altered, and enhanced in fat--from butter to olive oil, duck fat to lard. In their pure form, quality fats stand alone in greatness. Their richness and mouth feel or their bitterness and bite are distinct qualities which draw us to find and use the best. Fats also carry flavor, enrich sauces and provide a gentle medium in which to cook. We respect fats. While their pleasures are grand, great displeasure comes from the misuse of fat. For instance, the addition of too much butter to a sauce detracts from both the flavors developed in the sauce and the enriching quality of the butter—the sauce becomes cloying. If we overheat oil in a sauté pan an acrid taste forms ruining what is to be or already is cooking. When making vinaigrettes the addition of too much or not enough olive oil detracts or overwhelms the delicate balance of the vinegar and seasonings. Our relationship with fat is based on a balance in our cooking. Understanding fats and what they are to be used for is important. Duck fat has an intense richness which imparts its character on what is being cooked, from sautéed vegetables to poached fish. In the case of the poached fish, the fish is surrounded in a uniformly warm environment which keeps the fat and moisture in the fish. Olive oil posses similar characteristics to that of duck fat from flavor delivery to uniform cooking medium. Unfortunately in the case of olive oil heat eventually destroys its nuances. Thus for using as a cooking medium the heat must be kept even lower. Furthermore in comparing duck fat to olive oil we find olive oil to be a leaner fat and thus a better partner with richer products. We are looking for a balance between cooking medium and product being cooked to highlight the final dish. Butter is rich and decadent in its emulsified state, but when it is heated it separates and develops a greasy taste. In order to use butter in a warm state we must emulsify it with water, stock or another liquid. In keeping the butter in its emulsified state we are able impart butters richness and flavor to meats, fish, fruits and vegetables in the form of a cooking medium or as a light finishing glaze. The butter will then carry the flavor of whatever it coats to the palate quickly and decadently. Butter can also impart a rich toasty flavor to ingredients if its solids are allowed to caramelize. When roasting ingredients we add butter to the pan and allow it to foam and slightly caramelize. We then baste our ingredients with this butter. Fats carry the flavor onto what is being cooked. In the case of butter either emulsified or browned, it can carry the flavor of herbs and spices added to the pan during the cooking process. The flavors bloom in the fat and the ingredients benefit from this infusion. Flavored fats do not have to be used during the cooking process. We infuse olive oil with herbs and spices and drizzle it on dishes right before they are served. Here we have a last minute flavor delivery system. Similarly we shave butter flavored with yuzu juice and soy sauce over roasted matsutake mushrooms so that the butter just begins to melt and mingle with the warm juices enhancing both flavor and aroma. Foie gras fat seasoned with toasted garum masala drizzled over a warm salad of shrimp, turnips and passion fruit conveys an exotic nature and draws forth the flavors of India and the Orient. The use of fats also directs us in our preservation of products: the confit of meats and vegetables, potted rock shrimp in butter, lemon confit engulfed in olive oil. 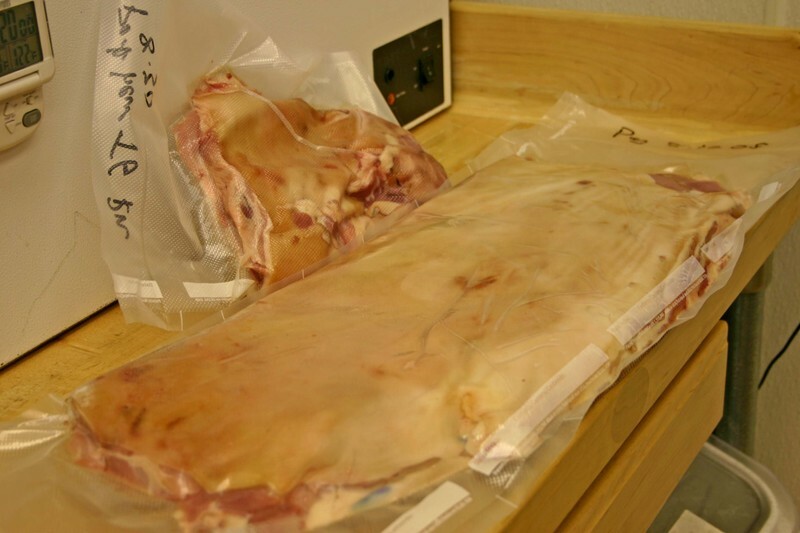 These fats allow the preserved product to mature in an oxygen free environment. No oxidation, no bacteria, only the gentle maturation of flavor. Fats and their ability to transmute flavors are essential to our cooking. They allow for limitless cooking methods and culinary combinations to be discovered. Contrast for the palate is the initial reasoning for our use of crusts and toppings. In order to make something pronounced there needs to be a counterpart. Without a canvas there is no painting. Without hot fudge, there is no sundae. In many of our recipes we design toppings which first add character and structure to the dish and second through the emergence of contrast enhances a certain aspect of the dish. Our thought process in designing toppings does not always originate from the topping or the product to be topped. Many times our inspiration comes from a flavor we wish to convey or a particular cooking method we wish to highlight. For instance, we gently poach chicken breasts in buttermilk to make them silky tender and slightly tangy. In order to make the delicate nature of the chicken breast remarkable and not just seem like an overly tender piece of chicken we top them with a crust. In one particular dish we made the crust with piave vechio cheese, butter, salt and espelette pepper. We pulverized the ingredients and then rolled them to an eighth of an inch thick. Next we cut the crust into squares which we used to top the just poached chicken breast. We finished the chicken and its crust under the broiler to melt the cheese, brown the crust and unify the two together. The flavor and texture of the crust accentuated the silky tenderness of the chicken breast, rather than allowing the breast to be construed as too much of a good thing. Toppings are equally useful and complimentary in our cooking. They add and unexpected burst of flavor, accent or crunch. Toppings help tie a dish together. Toppings can be adhered to proteins and vegetables and then seared or roasted, thus becoming a crust. In the same sense, a mixture of toasted pistachio nuts, yuzu zest, togarishi and muscavado sugar can be sprinkled on braised fish or slow cooked vegetables to add flavor explosions which accent the recipe. The choice and design of toppings and crusts are dictated as much from the ingredients used to the flavor sensations we choose to express. We can push flavors, textures and ideas forward by tweaking and adjusting what we use to accent our ingredients. Similarly, we can use main ingredients to demonstrate the importance of flavors, textures and intricacies in the toppings and crusts. The other morning when I got to work I put two pots of milk on the stove with a pinch of salt. When they reached a boil I threw dried chipotles into one, bay leaves into the other, covered them and set them aside to infuse. The theory was that by the time they were ready to use I would think of something to do with them. I strained the chipotle milk first because I knew from past experience that the longer I left them in there, the stronger the flavor would be. I definitely wanted it to be smoky, earthy and peppery, but not overly spicy. We needed a chocolate dessert for a special request and Alex watched me straining the chipotles and suggested tapioca. I liked it, so I soaked some small pearl tapioca in the chipotle milk and then cooked it with brown sugar. When the pudding was done I folded in some Valrohna Caribe chocolate. In the past, all of the chile/chocolate combinations that we had tasted were long on chocolate, short on chile, so we were looking for something a bit more balanced. I chose the Caribe because it has fruity, smoky undertones very similar to those of chipotle peppers and I thought that they would marry well. For service, we folded whipped cream into the pudding to lighten it. 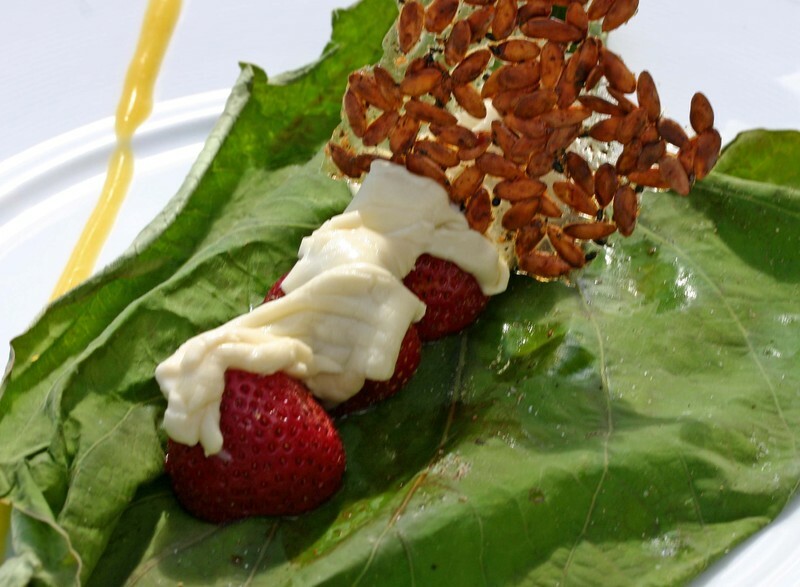 We served the tapioca with chocolate cookie crumbs and toasted almond wafers. We had just received a delivery of French Cantaloupes and their fragrance was wafting through the walk-in. We cooked some down with a half bottle of 1990 Suduiraut Sauternes to make a beautiful confiture and as I stood in the cooler inhaling the honeyed perfume of the remainder, I thought of my bay leaf infusion. One of our many kitchen toys is a Paco Jet. It's used to make ice creams and mousses. It comes with canisters that you fill with your base. The bases then have to be frozen for 24 hours before you can put it into the Paco Jet. The machine has a blade that finely shaves your base into the texture of the smoothest, creamiest ice cream. Many restaurants use them to make ice cream to order. We use ours for ice creams, sorbets, herb purees, vegetable mousses and anything else we can think of. So, that morning I wondered what would happen if I put chunks of melon into the Paco Jet container with a bay leaf anglaise and paco-tized it. Once I had the thought there was no turning back, I made a loose anglaise with my bay leaf infusion and poured it over chunks of melon. I froze it and a day later I buzzed it and the end result was heaven on a spoon. Savoring it was a true taste of summertime, creamy and soft on the palate, cantaloupes and cream in a way that I had never tasted them before. 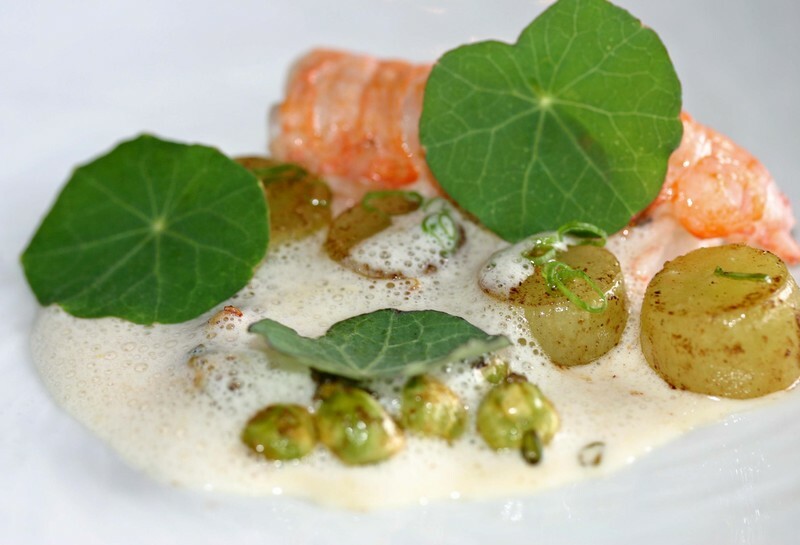 We served it very simply with a melon soup and tiny mint blossoms. Two different infusions became two very different dishes, but fortunately our guests enjoyed them both. Our combination of banana and tamarind came about because of several coinciding developments. First of all we were working with a tamarind sauce balanced with maple syrup and orange juice. The was flavorful though the consistency was off. I was looking for an atypical thickener and noticed some slightly under ripe bananas. I folded these bananas into the tamarind base and allowed the mixture to cook down and the flavors to marry. When the bananas had taken in a fair amount of the tamarind I pureed the mixture into what had the consistency of chocolate pudding. I reserved some of the mixture to make chips and cooled the rest down for later use. The thickening qualities of the banana created a dense gelatin like base. (I can actually dice the banana tamarind in its chilled state.) The banana acted not only as a thickener but also a soft medium to tame the intensity of our tamarind sauce. 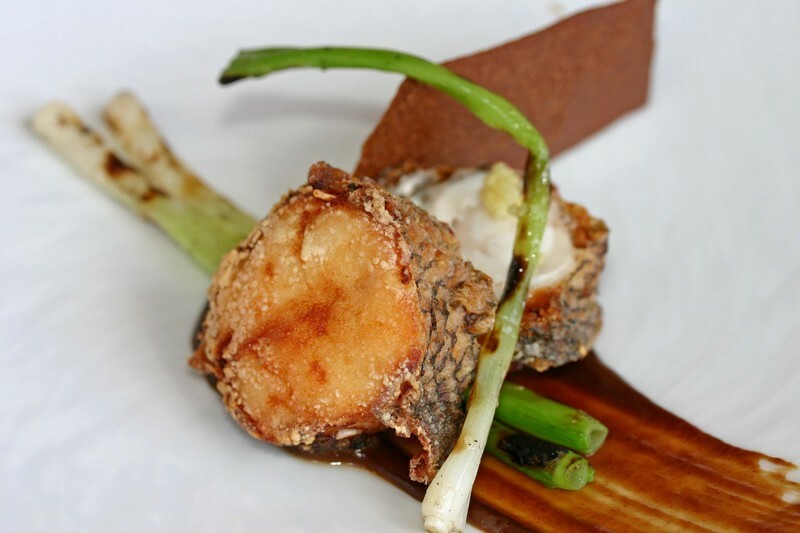 We first used the banana-tamarind with crispy bass, though many more combinations are in the works. Pristine black bass arrived on our doorstep. 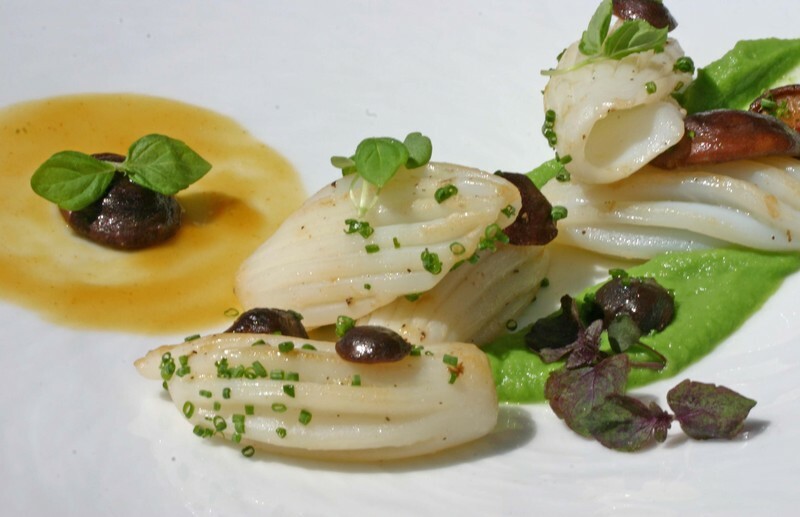 Its quality has inspired five new dishes which can be seen in our black bass photo album. 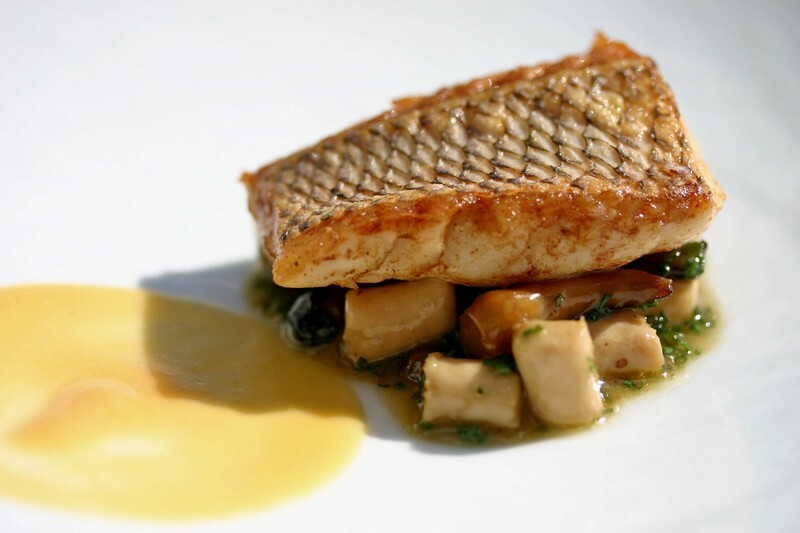 These dishes were assembled together in a black bass menu. I could not survive without bacon and tomatoes. Actually, it is the bacon that I am hooked on. In the summer I dream of BLT sandwiches. I never make them. It always seems like to much trouble. How is the worlds simplest sandwich too much trouble? When you are running around stopping to assemble a sandwich for yourself just does not fit into my day. 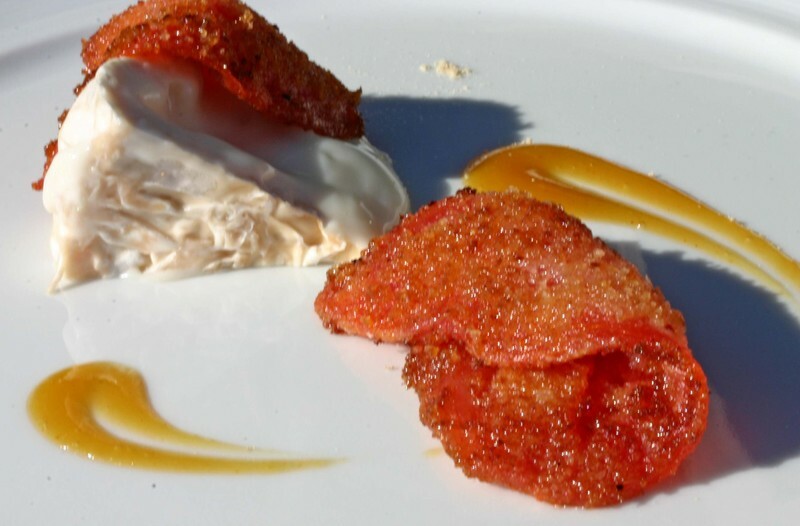 Yet, the idea of a BLT pulses and resonates in my thoughts and surfaces in the development of our dishes. Yesterday, we were working on a cheese course. We had a beautiful cheese Hyku, from Goats Leap dairy. It has a bloomed rind with a molten interior. In order to highlight the decadent cheese we opted to crust tomatoes with our smoked toast (here I combine the flavor of bacon with the toast and still allow the cheese to shine). To accompany the cheese I looked for some spice and acidity. We used our calamansi lime mustard fruit to balance the richness. I know, we did not incorporate lettuce; lettuce is optional. Instead we added a dusting of mahleb which has a nutty bitterness similar to romaine lettuce hearts, but without the green. We recieved some beautiful melons the other day; their aroma tantalized my thoughts and I eagerly dove into them. The first melon was mine, I cut it open, removed its guts and devour the chilled, sweet floral flesh. I took a moment to look around me with the melon juices dripping from my fingers. It dawned on me that the guts always go in the garbage while the flesh of the fruit is devoured. I looked at the seeds and realized I could make melon pepitas (the salted dried pumpkin seeds flavored with lime juice). I soaked the seeds to remove any melon membrane and then layed them on a sheet pan to dry. After most of the moisture was gone I seasoned them with salt and lime juice and dried them further in the oven. The seeds dried and became crunchy and nutty with undertones of the melon they had come from. With the pepitas in hand, I now had many options. I decided to sprinkle the pepitas on a nigella seed caramel and bake them in the oven to unify the flavors and create a pepita-onion crunch. The finished product marries the multiple flavors into a crisp melon and onion melange. 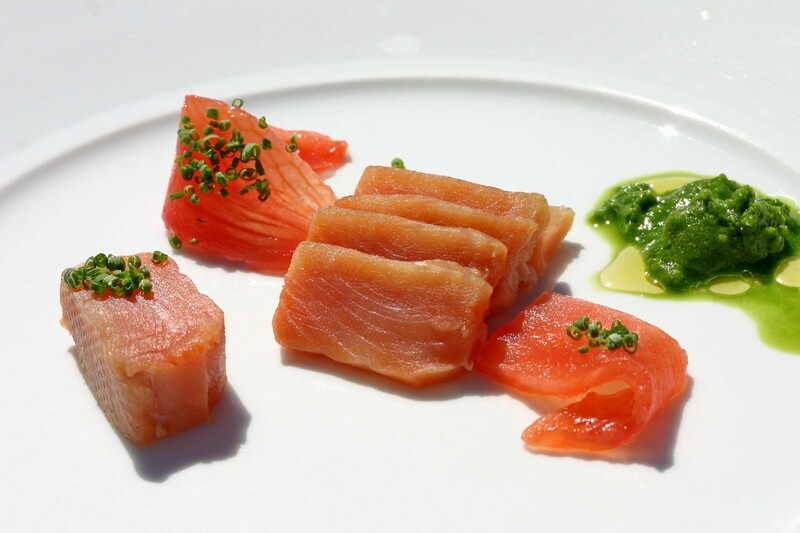 We will use the crunch with our nori wrapped black bass and melon-sauternes confiture (the use for the decadent and heady melon flesh). Just finished butchering and I felt the need to share, it's just a little something for the carnivore in us all. Salt cod is one of my favorite ingredients. As a child we would visit my Aunt's family for Christmas. They were a big Italian clan and we would always have fish for Christmas Eve. There were many different offerings but my favorites were the things that I couldn't get anywhere else. We always started the meal with spaghetti with baccala. As I remember the pasta was tossed with olive oil, salt cod, pine nuts and garlic. It was delicious. After the pasta course an array of seafood dishes were put out. There were two dishes that we would fight over, the fried baccala and the fresh sardines. The salt cod was simply dipped in flour and fried in olive oil. I loved the crispy chewy texture of it and that saline taste of the sea. The fresh sardines were also dredged and pan fried. They were served whole, although we took the heads off for my Aunt. She was and still is a bit squeamish. The beauty of eating the sardines, especially for a child, was that they were finger food. You had to peel the fillets from the backbones ever so carefully, leaving the bones intact and the fillet unbroken. My Aunt's mother would leave the leftovers in a cold oven after dinner, we ate early, and all evening long we would sneak back into the kitchen for cold baccala and sardines. The leftovers were usually gone by bedtime. So, every so often I feel the tug of my childhood and order salt cod or sardines. Today I pulled out a side of salt cod and set it to soak under cold running water. After it was fully re-hydrated, I blanched it three times to pull out the excess salt. Then I poached it and let it steep in the liquid with some japones chili and fresh oregano. I tossed the warm flakes of fish with a cooked egg white mayonnaise, aleppo pepper and freshly ground lampong pepper. We are serving it cold tonight as the first course, with a margarita jelly (Corazon tequila, lemon and lime juices), yellow plum purée and diced watermelon. It still has that earthy flavor and chewy texture that I adore but it's a bit lighter in it's summer garb. The beauty of being a grown up is that I can have my favorite ingredients any time the mood strikes. Although I must confess, had the cod been ready in time for lunch, I would have dusted it with flour, fried it and served it alongside an heirloom tomato salad with fresh basil and McEvoy olive oil. Oh well, perhaps next week. I thought I made great potato puree. I did. Now I am able to make incredible potato puree and it is functional. How can potato puree be functional? For years, as long as I have been cooking, making mashed potatoes has been a last minute event and an arduous process amidst the chaos of getting ready for service. 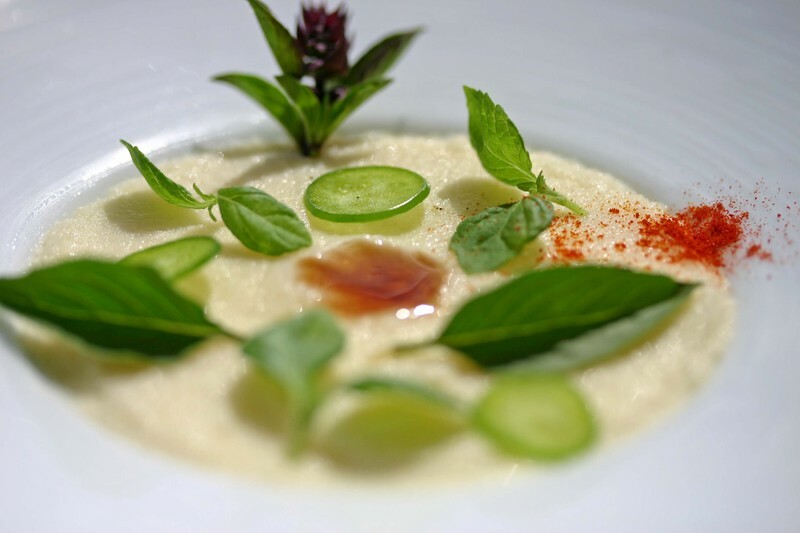 Potato puree had to be made at the last possible moment to insure silken textures and bright flavors. While I love mashed potatoes, I began to avoid them as our remote nature and need to do more than cook has hindered some of these last minute preperations. If I can prepare bases ahead and eliminate steps during the witching hour I am all for it. Hence my discussion on functional mashed potatoes. Heston Blumenthal of The Fat Duck has done the research and put pen to paper in his first book Family Food: A New Approach to Cooking. The process is simple and while I will note the potatoes are thrice cooked I believe the price of the book is well worth the knowledge of the technique. Besides, the book has many more concepts, techniques and ideas which should be part of the culinary canon. Sure the book looks simple. Try it, you will understand. Today, we opted to use the potato as a palate for flavors. The Thermomix--our newest kitchen member--is proving to be both inspiring and perplexing in its applications. While its basic uses are straight forward I am having difficulty aligning them to our culinary applications. It is like learning to ride a bike in German. Despite my continued failures, I persist and am learning more about the Thermomix and with each hiccup comes greater possibilities. This morning I was able to work out a hot maple syrup gratin which I then crusted with smoked bread crumbs and served with fresh bacon, sauerkraut, nectarines and horseradish. The gratin is ethereal in texture--whipped maple syrup--which is then broiled with a sprinkling of our smoked toast. The light crumb provides a bit of texture before the gratin melts onto the palate. I was unaware that maple syrup would naturally ferment. I should have thought more closely about it, I mean cider ferments, grape juice ferments, I wanted to find fermented maple. I got off the phone with Steve at blis caviar and he had some fermented maple syrup. Perfect. Now I have a base for the continued development of our maple vinegar and perhaps some maple cocktails as well. The bubbling syrup should arrive later this week and our process of making vinegar should quickly follow. Now, I must have patience; not one of my better traits. I guess the time will allow me to delve deeper into the applications of fermented maple; I see maple braised cod cheeks and fermented maple ice cream. I just finished drawing, scribling, underlining and reading The Creative Habit: Learn It And Use It For Life by Twyla Tharp. Interestingly enough, I was directed to this book by Patricia Ryan Madson, the author of improv wisdom: Don't Prepare, Just Show Up. The greatness of The Creative Habit is that it is able to put to words the process of creativity; it never slips from the message that it is work. It is truly important in understanding the principle of creativity--work is involved and expected--while applying it to many different fields. The book acts to spark new ideas, cement old ones and get individuals to understand the creative work ethic. For me, the most telling story came in Twyla's story about Buster Keaton--an actor and comedian I had previously not thought of-- and his approach to comedy. Simply put "he [Buster] had an economy of purpose and execution." Keaton worked through his comedic sketches such that there was no filler. We recently invested in an electric wine chiller. It’s something that we’ve considered purchasing for a while and now that summer’s almost over, we finally took the plunge. Over the years we’ve slowly amassed a small collection of wine. We both prefer aged wines to their youthful counterparts and have found that even a single year’s worth of cellaring can allow a wine to evolve into something more balanced and complex upon the palate. We see wine as an investment in our own enjoyment. There’s nothing better than to tuck away a few bottles of a particular vintage and pull one out every so often and taste it’s changing flavors and textures as it softens and matures. Harsh edges become smoother, acidity declines, fruit flavors bloom and ripen, the passage of time can do glorious things for a wine. Of course, there is such a thing as too much age and wines can become flabby and soft, colors leaching away into transparency, fruit flavors withering into a watery shadow of their former opulence. Like anything else, aging wine is a balancing act and a bit of a gamble. A corked bottle or a weak wine will not improve with age and that dreamily anticipated bottle could end up a disillusion. Fortunately many of today’s wines are built to last. Considered drinkable upon bottling, a bit of patience will usually reward you tenfold. I have to admit that I have always been of a mind to save the best of anything for last. As a child I would eat around the choicest bits on my plate, trying to ensure myself a spectacular finish. More often someone else would reap the benefits of my strategy as I would be too full to finish. It was a hard lesson and one that I still fall victim to at times. I love the idea of savoring the best bites but it is very difficult to serve them to myself first. I am the same way with wine. I love to buy and tuck away bottles of enduring richness and character but I am hard pressed to pull them out of the cellar again. Beyond that I tend to squirrel away the best bottles in the deepest recesses of our wine closet so that we are unable to reach or remember them, much less drink them. Fortunately Alex is not of the same temperament and he will dig through my barricades to find a hidden treasure if the occasion seems to call for it. He tends to think any leisurely evening alone at home together (which does not happen as often as we’d like) is an occasion worth celebrating and thus defeats my parsimonious tendencies. One of the best things about our new wine chiller is that it eliminates the need for planning ahead. White wine by necessity tends to call for advance planning since the desired temperature cannot be reached at the drop of a hat. This being the case we normally have a “house wine” in our refrigerator, these consist of tasty quaffable wines that are not too expensive. Some recent house wines have included the 2002 Truchard Roussanne from Napa Valley. It is a wonderful juicy wine with a medium acidity, a syrupy palate and flavors of marmalade, granite and honeysuckle. Also tasted recently was the 2002 Alban Central Coast Viognier which has a rich golden color and a lively palate with a backbone of acidity and stone fruit that made our mouths water. The 2003 Peter Franus Sauvignon Blanc, from Sonoma, was unusually rich for it’s varietal, medium bodied with grassy undertones to its gooseberry and passion fruit characteristics. The “special” white bottles get pulled out less often than the red ones because by the time we think of it it’s too late. But last night Alex excavated a 2001 Peter Michael “La Carriére” and put it in the wine chiller. It was simply amazing. The color was a deep gold and it was incredibly rich and full bodied on the palate. The very first sniff told you that it was something special and when it hit the palate it didn’t disappoint. It had a rich butterscotch flavor with layers of caramelized bananas, sweet spices, roasted lemons and a smoky background. It was a sipping wine of the highest order and it will last for years. But thanks to Alex I didn’t have to wait that long to enjoy it. I began today unrested, unsettled and uninterested. Not a great begining to a day in theory devoted to expanding horizons. Well, I cannot sit still and began looking for inspiration. Many times my ideas are sparked while I am absorbed in a process and a fragmental distraction occurs stimulating an idea. Today I went to get our wireless modem for our computers fixed. I called the store and they said bring it in and the tech support will examine the problem on Monday. After an hour drive I arrived at the store. It was closed. Isolation is not good for tech support. I was also hungry, really hungry and Aki and I had been talking steaks recently; our closest steakhouse is really a burger house decorated with golden arches and Irish prefixes to all their dishes. Anyway, my need for a great steak led me to a store that is hit or miss in the steak department--today was a hit. They cut me two two inch Porterhouse steaks, I grabbed a loaf of some local bread and headed home. I let my mind wander during the hour drive home. I think there are more than five tastes: sweet, sour, salty, bitter and umami. These are the recognized tastes. 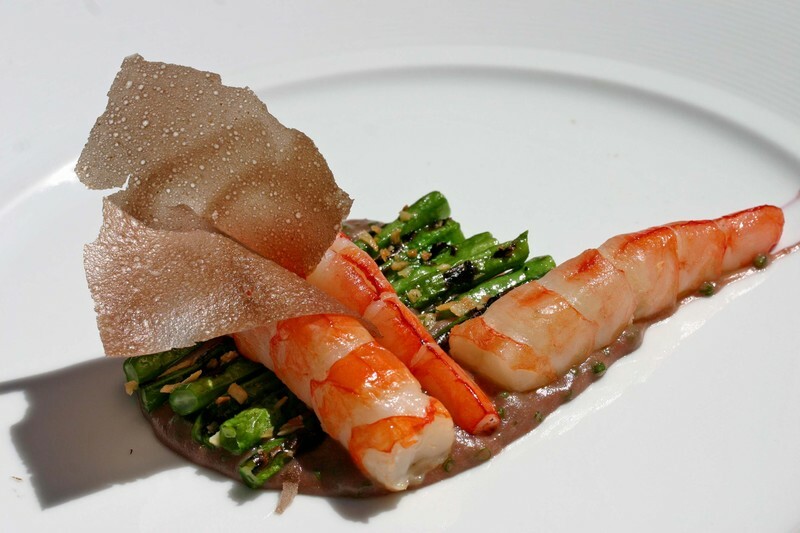 We weave them together in our cooking; they influence and structure our cuisine. Yet, there are two other tastes instrumental to our cooking. The one which first popped into my mind during my drive was earthiness. I was wondering why I have such an affinity to jalapenos, tequila, Bordeaux wines, curry leaves and tobacco like ingredients. They all have an inherrent earthy quality not found everywhere. I smiled in the car as this thought bounced around my head--I thought of another taste--now I need to do some actual research. I arrived home, bounded up the stairs, formally presented the porterhouse steaks and then blurted out "I think there is a sixth taste." Aki smiled and said "sure, heat and spice." That was not the response I was looking for and yet she had a valid point. We integrate both heat and earthiness into dishes in conjunction with the five other acknowledged tastes. It just took an isolated drive and the distraction of a couple of porterhouses to let the idea float to the top. Now we begin the testing and analysis of these thoughts. I forsee a rare porterhouse topped with jalapeno slivers and a curry leaf margarita to begin the research. Buttermilk is the secret unsung star of our kitchen. It provides acidity, it is a tenderizer, it adds richness, it is inexpensive and it tastes really good. We use it in dressings and marinades, scones and bisquits, ice cream and as a poaching medium. While buttermilk acts as an incredible poaching medium and an equally good carrier of flavors it is not clean. Even when we moniter temperatures, the buttermilk has a tendency to coagulate and fill in nooks and crevises in poultry or other protiens we choose to poach in it. Because of this inherrent flaw, we have strayed away from using buttermilk to cook in. However, today through another one of my many misteps, a solution became apparent. I am still trying to coat fish and cook it in yogurt. Today, I got closer being able to wrap the fish in the yogurt and basically cooking it in a yogurt bag. Yogurt, like buttermilk has many great culinary attributes and these were carried into the fish; though aesthetically I could not serve the fish in the yogurt. Yet, the yogurt tenderized and sealed all the flavor into the fish and easily pulled away leaving no visual trace of the yogurt. With these positive results I plan to apply the same technique with buttermilk; allowing for a mud bath cooking envirionment which is easily removed. Gadgets are cool. Functional gadgets and machinery go way beyond cool. I have recently aquired a new gadget for our kitchen, a Thermomix. I have been dreaming of a Thermomix for almost two years now, and we have finally aquired one for our kitchen. Because we are short on space and staff, the Thermomix enables us to free up several of our hands throughout the day and night. I am truly captivated by the possibilities of the Thermomix and what we may try and execute. Unfortnately, as with many of my new projects failure and roadblocks abound. I began today working with salted honey mousse; I ended up with a delicate froth; a tasty and usable product but not my vision. Over the coming days, weeks and months, I plan to integrate the Thermomix into our cuisine and see what it can do for us. Today's salted honey worked well in with our smoked toast crusted grouper cheek. At what I considered to be my first serious job as a cook, I was lucky to be in a kitchen where everyone cared about the food. We were all there to learn and to become the best possible cooks that we could be. We wanted to be the best kitchen in Boston and we wanted to wring every bit of knowledge we could out of the Chef in question. The food was innovative and somewhat avant-garde. I soaked in all of the details that made the kitchen so special, from the delicately sliced herbs to the variety of china employed to frame each dish. The restaurant had been open for less than a year but had received good reviews and a lot of buzz. The Chef was young, hungry and ambitious, as was his brigade. He was always on the lookout for new ideas and techniques. It was a fabulous opportunity for someone fresh out of culinary school to learn fine dining from the ground up in an innovative establishment rather than a dinosaur. We cooked for a variety of famous chefs, whose names I would not have recognized when I first arrived. I honed my knife skills and learned the importance of details and precision in cooking. I also learned that work did not end when I left the kitchen. 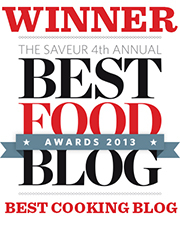 I always loved dining out and curling up at home with some food writing. The Chef made me see the importance of a wide range of cookbooks and magazines. In order to succeed I needed to stay abreast of the culinary world at large. I needed to look beyond my own orbit and to be aware of what was going on in our world and most importantly, to learn from it. The hardest lesson I learned from that Chef was not about cooking but about management and leadership. The lesson was that creating a strong staff is the backbone of a kitchen and of any establishment. When I began work in Boston I caught the end of a beautiful wave and when it crashed, it crashed hard. There is a fair amount of turnover in any professional kitchen. By nature, young cooks are transitory, they are out to learn as much as possible in as short a time period as possible and they are always looking to improve their resumes. The common theory is that a strong resume is the key to having your own kitchen. When I arrived in that kitchen there was a diverse spread of very experienced and inexperienced cooks. Although there was the stereotypical kitchen culture of braggadocio and bravado, underneath that was group striving towards a common goal. It was a team in the best sense of the word. Within six months we had turned about 50% of the staff. With that change came a change in culture and attitude. Raises and promotions were given within the brigade according to the Chef’s internal methodology. Unfortunately, his thinking did not necessarily jive with seniority or with the perceived hierarchy of the cooks, causing bitterness and rifts among the staff. New hires were made based upon necessity rather than skill or attitude. The friendly camaraderie and teamwork that were so much a part of the atmosphere seemed to disappear leaving behind an edgy atmosphere of competition and backstabbing. The Chef hit a slump and seemed to lose his creative edge, withdrawing from the kitchen as the environment darkened and unraveled. It was a sea change and I have heard that eventually the tide turned back. He was able to pull things together and take back the reins. I was long gone though, choosing to remember the best of what I had learned there, not the dark days before my departure. I feel lucky to have been there and to have learned from the experience. 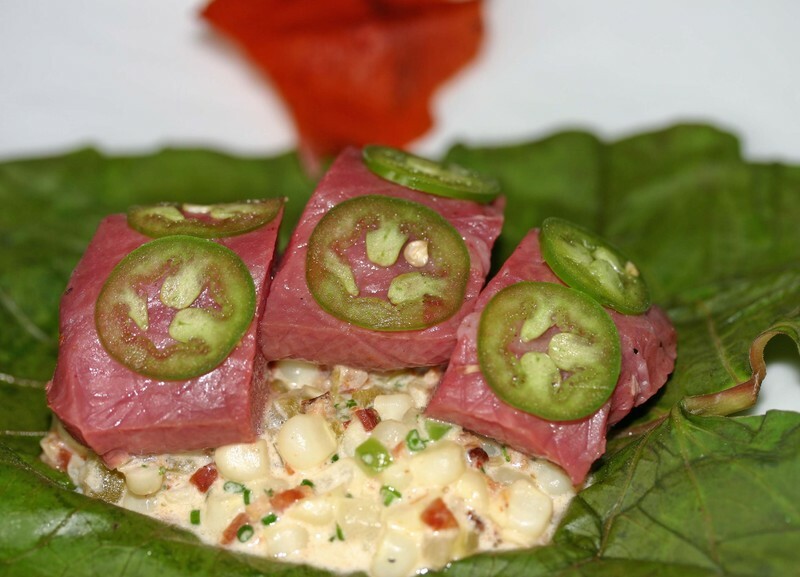 We celebrate the details in our food using small accents to create harmonious flavors. We keep an eye on the world at large for ideas and inspirations. We’re not afraid to try new things and share the experiences. We hire everyone on a trial basis and we are not hung up on a candidate’s past experience. We evaluate equally based on enthusiasm, attitude, desire and skill. We are not afraid to let people go early on if they seem like a poor fit. I believe that it is important to protect your environment in the front and in the back of the house. People should be excited to come to work every day. It’s not an easy thing to accomplish, as staffing is always an issue. But I’d rather create a great place to work, even if I have to work harder to make that happen, than a well-staffed place where no one is happy to be there. It’s still a work in progress, but then so is our food. I find ideas everywhere and am quick to adapt them to our kitchen. One flavor combination that is bounced about my brain is chocolate and zucchini. This combination also happens to be the name of a well known food blog which in turn keeps it at the forefront of my mind. Today, we were lucky to work with some beautiful zucchini and I was able to take it for a dessert. I have also been working on our hot chocolate gnocchi thus I finally had the opportunity to marry chocolate and zucchini. In the past I have also found an affinity for chanterelles and zucchini and the bitter cherry notes of mahleb seem to unite these flavors. 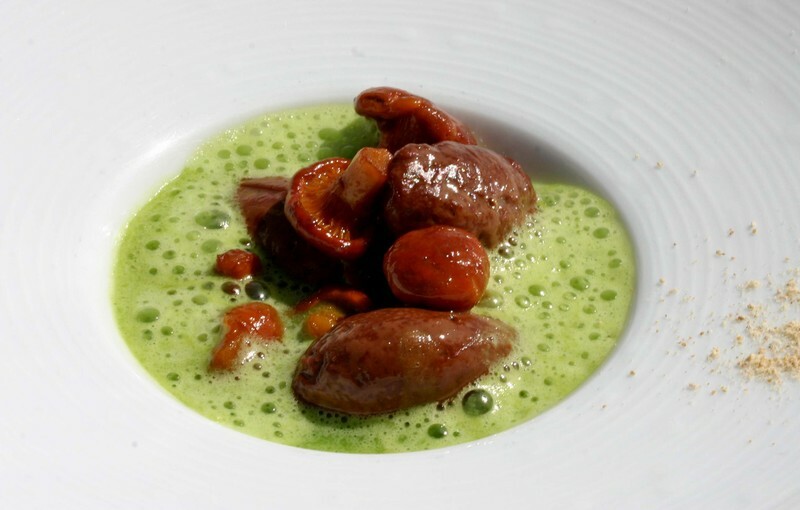 Hence our dish of zucchini soup with hot chocolate gnocchi, candied chanterelle mushrooms and mahleb. Guests and others have been asking about the process for making smoked corn sauce, so I figured I would share. Currently we are getting some incredibly fresh and sweet local corn which in part plays a crucial role in the vibrancy of our sauce. Besides the freshness, the process for making the smoked corn sauce is simple. We cut the corn off the cob and sweat it in whole butter. We take the cobs and smoke them for an hour to infuse with hickory flavor. After the cobs are smoked we seal them in a bag with half and half overnight. The next day we cook the half and half and corn cobs for an hour in the bag at 160 degrees. After cooking the base, we cool it quickly in an ice bath. Once the base is chilled we strain it over the corn kernels and cook the two parts together. The combined corn is then pureed, enriched with butter, strained and chilled. We use the smoked corn sauce in several dishes: poured over a fricassee of chanterelle mushrooms and chorizo, as a light froth over slow cooked fish, thickened as a pudding with maple vinegar and slow cooked rabbit. Summer Camp was one of my favorite places in the world. I went to several different ones over the years but the first two stand out as the best. I spent the first several years at Day Camp. The I moved on to sleepaway camp in New Jersey. It was only a few hours away from my home in NYC but it seemed like a whole different world. We were located on a lake in the woods in the middle of nowhere, or so it seemed to me. Instead of sweltering days and sultry evenings, we had cool nights and early mornings with temperatures that slowly rose into hot sunny afternoons and evenings with the temperatures dropping as the sun went down. We had line-up before breakfast in the mornings in sweatshirts and jackets. As long as it wasn't raining we met outside on the field for the daily announcements. On rainy days we met in the dining hall. Tables were divided up according to camps (there were three) and age groups so that we met people outside of our own cabins at meals. My favorite days were the ones when they served blueberry cake. It was probably from a mix but it was served warm and we all loved it. It was a white, or yellow cake with blueberries scattered throughout and a crumb topping. The rule was that platters had to be emptied before you could send someone back for seconds and on those days we would quickly move all the cake onto one plate and send someone running, actually speed walking because we weren't allowed to run, back to the kitchen counter for seconds. I know that I wasn't alone in my love for this cake because on those mornings it was a race to get seconds for your table before the kitchen ran out. Once it was gone that was it. The cool mornings here in mountains remind me of those days. Summertime weather here is very reminiscent of summertime at Silver Lake. It's what we call monsoon season now so there are thunderstorms in the late afternoon. Thunderstorms in Jersey were tremendous. I remember sneaking out of our cabins to watch the thunder in the field and doing rain dances outside our cabin at night. I also remember a summer many years later on Nantucket when a friend and I went out in a huge storm on bicycles. We recklessly splashed through puddles on a road alongside the beach, watching the crashing waves and screaming into the salty winds. Storms remind me of the power and beauty of nature and the wild freedom trapped inside each of us waiting for a moment to be free. This morning was chilly, with the air scrubbed clean from the evening rains. The sun was peeking over the horizon as I drove to work and the sky was ablaze with a golden, rosy glow. My mind was wandering through summers past as I drove toward the day ahead. I had a little extra time and some fresh raspberries so I decided to recreate my favorite breakfast cake. 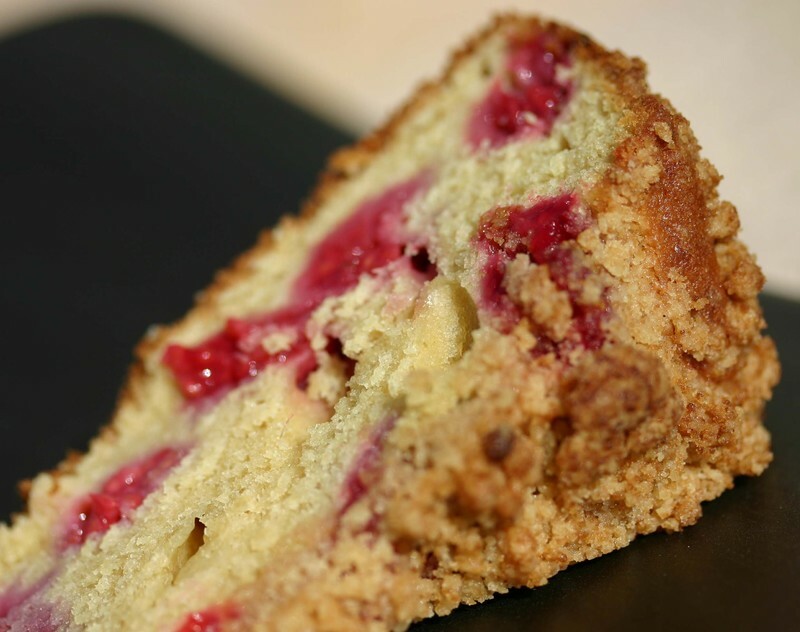 A brown sugar cake, studded with raspberries and a cinnamon crumb topping served hot from the oven. I can only hope that the guests enjoyed it as much as I did. The day began with judging a chile cookoff and was followed by a tremendous thunder and rain storm. The storm acted as an awakening. We were sparked to try out an attempt at making yogurt ravioli. The watermelon dashi was inspired by the previous days tomato dashi. In making the dashi, we were able to use the residual watermelon pulp as a chip. The yogurt ravioli are filled with our mango-miso, a fun enrichment to the bonnito infused watermelon broth. 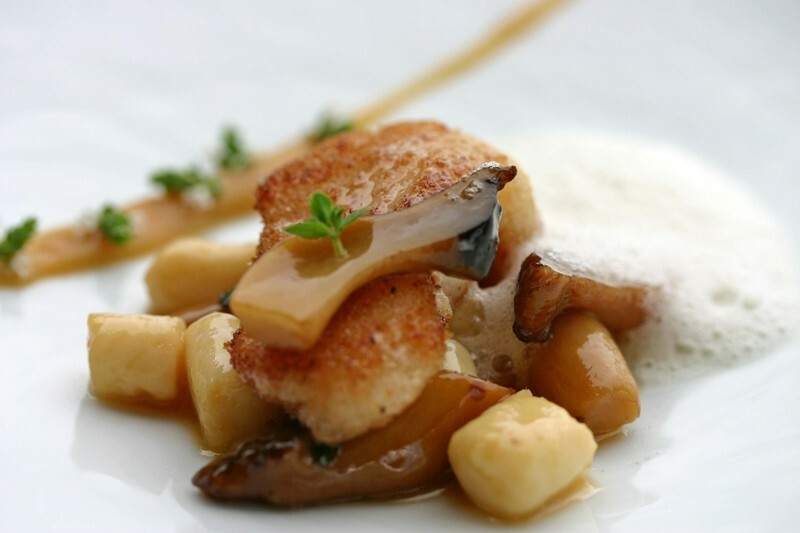 The chanterelles add an earthiness as well as floral apricot notes to the dish. 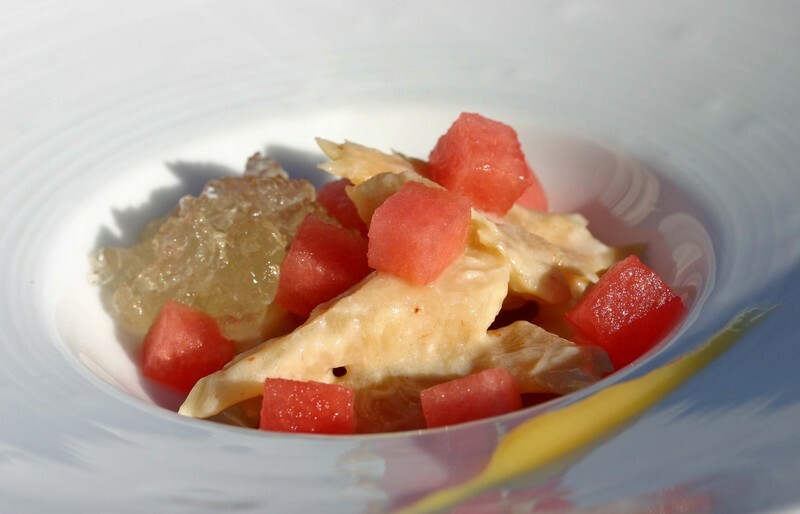 The watermelon chip adds crunch and the olive oil adds a peppery enrichment to the whole dish. Today we were able to make forward progress with our culinary evolutions. Now we are working on mastering the process of making the yogurt ravioli. Tonights menu features our early attempts at this dish before we exacted the method of making the ravioli. In the upcoming days the ravioli will be put into service. As we may have mentioned before, Pagosa is not an easy place to get to. One of our guests discovered this to her dismay on Thursday. After a long morning of traveling, she arrived in Denver only to be bumped from her flight to Durango. The best offer that the airlines had for her was to be rerouted through Pheonix, arriving in Durango at 11:30pm. Her original flight would have landed at 12:43pm. After much hassle and negotiation, she was lucky enough to be at the desk when someone cancelled for a slightly earlier flight to Durango. She was able to snag the seat. She was going to arrive at the Guest House late and weary, missing dinner and an afternoon of fun and relaxation. All she asked for was a glass of red wine and perhaps a snack in her room. What to feed her? Well obviously, something to go with her wine. What could be better than a bit of cheese. Many years ago, Alex and I arrived at an Inn in Maine, tired and late, and waiting for us was a lovely basket with fruit, cheese, crackers and various other sundry. We happened to have a bottle of wine in the car and created a late night feast for two. It was early spring and the night was dark and cold. But we were snug in our room in an empty inn with a warm fire, our wine and some cheese. With that memory in mind we created a nourishing snack for our guest. There was a half bottle of Antinori Chianti, some gorgonzola dolce, MouCo ColoRouge ,organic crackers and a bowl of Colorado cherries, bing and ranier. A range of tastes, textures and flavors that would go well together and soothe our traveler before climbing into bed. It was exactly what we would have wanted had the situation been reversed. In an attempt to capture flavors and highlight ingredients we put together a delicate dish of tomato dashi in which we may present our hot mozzarella. The dashi base is made from the concentrated juices exuded from our baby marinated tomatoes. We infuse the tomato juices with fresh marjoram and shaved bonito. The broth is then filtered and balanced with lemon juice. To serve the dish we poach our mozzarella and slide them into the broth and garnish with marjoram blossoms and leaves and Armando Manni olive oil.